Add Fitness and Fun to Reminiscing Sessions! Catch the fun and spice up group chats or activities. Spark lively, often humorous conversations! Easily adapted for all age groups and ability levels. 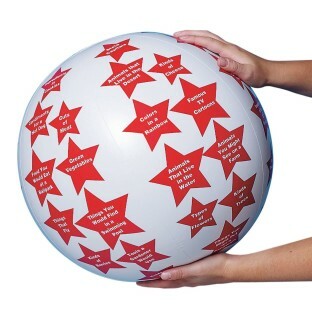 We love this ball! Not only is it a good conversation starter but it is great for when a CNA is facilitating the activity. It takes the thinking out of coming up with questions. We can play for hours! In an office where we do training programs for a a large hospital system we are always on the lookout for new icebreakers that don't make people feel too self-conscious. People loved this activity3 items from the star under your right thumbright away. We prefaced it saying there are almost no wrong answers. If you want to say you put chocolate in your spaghetti sauce or play with bricks in a pool who are we to say you are wrong?